Jonathan Hopkirk and Adam "Kurl" Kurlansky are partnered in English class, writing letters to one another in a weekly pen pal assignment. With each letter, the two begin to develop a friendship that grows into love. But with homophobia, bullying, and familial abuse, Jonathan and Kurl must struggle to overcome their conflicts and hold onto their relationship, and each other. 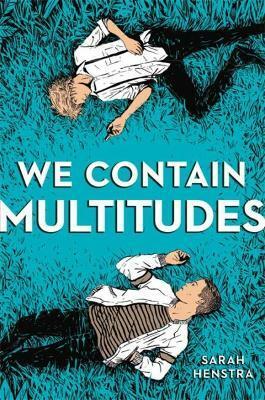 We Contain Multitudes is the sort of novel that has readers falling in love with their characters, becoming so invested in their stories and conflicts that it's impossible to put the book down. The literary languages and references throughout (particularly to Walt Whitman) bring to mind award-winning novels such as I'll Give You the Sun, Aristotle and Dante Discover the Secrets of the Universe, and more. With a growing appreciation for LGBTQ+ characters and stories, and such a compelling novel with engaging characters and stunning language, We Contain Multitudes has the potential to be a commercial and literary success. --Kirkus, starred review "The title of this book is incredibly fitting. Jonathan and Kurl are two complex and fascinating characters, and they instantly drew me into the world created by their letters and their love. It's an astonishing romance and character study that also happens to be full of gorgeous writing." --Robin Talley, author of Lies We Tell Ourselves and Pulp ..".her [Hentra's] skill lies in painstakingly depicting each boy's slow move toward vulnerability until a smoldering, secret romance begins. This exploration of self and sexuality is sure to be quickly embraced by fans of Love, Simon, They Both Die in the End and The Gentleman's Guide to Vice and Virtue"
Sarah Henstra is a professor of English at Ryerson University. Sarah is the author of the YA novel Mad Miss Mimic and the adult novel The Red Word. Sarah lives in Ontario, Canada.